Have you ever got out of bed in the dark and hit your toe on the bed post? Ever shut your thumb in a door? How about slicing your finger with the edge of a piece of paper? You can almost feel the pain that each of these things brings when I say them can’t you? I have learned that if you are going to move at all in this world you are going to hurt yourself. Often we hurt ourselves by putting ourselves in places that we know we should not be. Many of the pains in my life and the bruises to my ego are self-inflicted. Whenever I hurt myself as a child my mother would warn me to be careful. I would. For an hour! Then I was back to my reckless life of fun and frolic. The good news is that pain goes away. Remember that toe question I asked you? The pain will probably go away before the bruise does. Eventually all of the evidence that you were ever hurt will fade from your being. Our key to maturing in this life will be to learn the lesson but stop replaying the accident. When we rewind we remind ourselves. Fast forward to a new space on your life tape today. Record a new memory and plant a new seed. 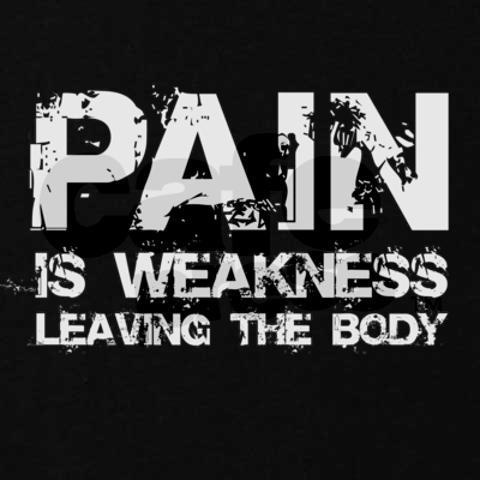 Pain is a part of your life but as the Marines say…pain is just weakness leaving the body!